Our performance-based teaching method is an immersive experience that inspires our students to be their best. We believe the best way to learn music is to play music. We take students from the lesson room to the stage, developing both their confidence and musicianship with programs designed for all skill levels. Specializing in Rock Performance Programs for ages 6-18, our performance-based teaching method is an immersive experience that inspires our students to be their best. We get our students playing music as quickly as possible because we know that that is what our students want to do. As a result our students become more interested in the theory of music. We teach guitar, bass guitar, keyboards, drums and vocals in an interactive environment. To date, our students have worked with notable guests and our School of Rock Markham House Band has played numerous concerts in Markham and has also performed at the Cleveland Rock and Roll Hall of Fame, Lincoln Hall in Chicago, Legendary Dobbs in Philadelphia, the boardwalk in Wildwood, NJ. This past summer, they travelled to Punta Cana in the Dominican Republic to perform for 1 week at the fabulous Hard Rock Resort! 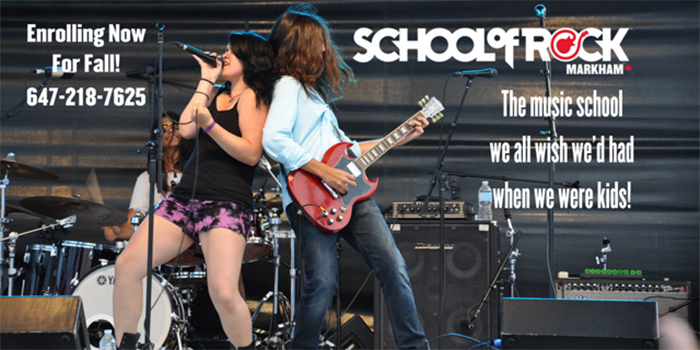 School of Rock students have been featured on Dancing with the Stars, MTV, VH1, Billboard, Rolling Stone, Guitar World Magazine and so much more! Our Little Wing Programs encourages your 2-5 year old to reach their developmental milestones through fun musical activities. Our classes were designed alongside leading experts and PhD’s to inspire the social and cognitive development of your child while enriching their language, literacy, and physical development. School of Rock also offers programs for toddlers as well as an Adult Program for “Rockers” over 21 and Summer Day Camps for ages 9 and older! Little Wing is School of Rock’s answer to early childhood music education. At Little Wing, we believe that if we want kids to learn to love music, then we must give them loved music to listen to. They should experience classic songs that have inspired adults AND kids throughout the history of rock music, not nursery rhymes like ‘Wheels on the Bus’. Little Wing’s immersive music program will foster a love for music in your child that will last a lifetime. Please call us today at 647-21-UROCK (647-218-7625) to set up your FREE 30 minute trial lesson and tour of our unique facility!